I was buying my favorite cup of hot artisan chocolate at Bo's Coffee when I came across their chocolate display on the counter and as a chocolate lover my initial reaction was to check the latter. To my surprise those were the chocolates that I have been looking for years- chocolates mixed with Filipino favorites and crafted by Theo and Philo. 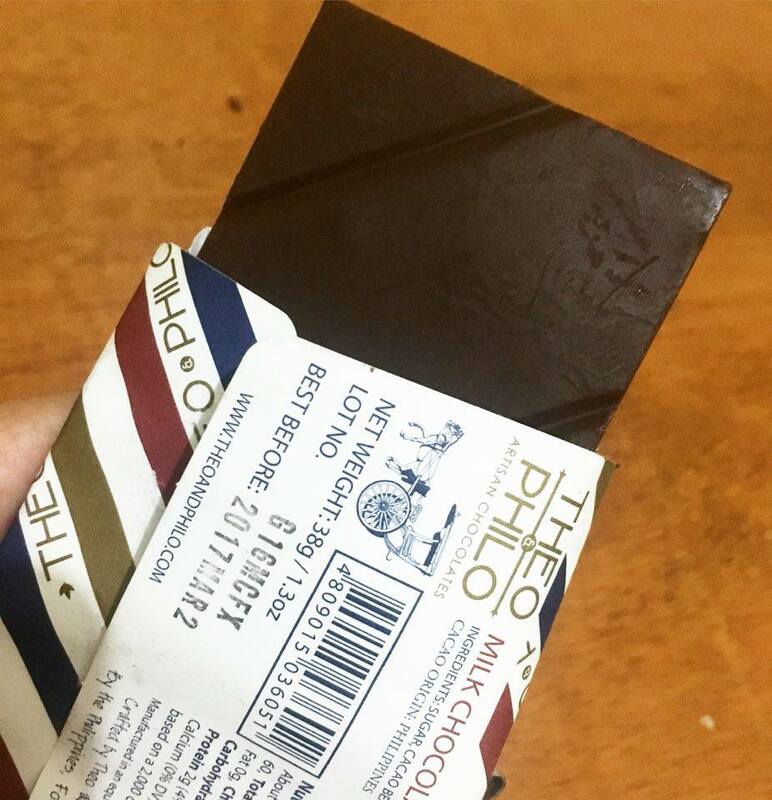 I checked their website as soon as I got home so that I could know more about Theo and Philo chocolates. While holding their chocolates, I read on their page that their chocolates uses cacaos from Davao and sugar from Bacolod and their chocolate factory is located in Manila. They produce small quantities of chocolate for each batch and they make sure that their people will give their best when they produce each chocolates. 1. Find the right cacao beans. 2. Roast the cacao to release the chocolate flavor of the beans. 3. Crack the cacao beans and remove the skin to get the cacao nibs. 4. Cacao nibs are grounded to become cacao mass. 5. Cocoa mass will be placed in wet mill to be refined and develop it's flavor. Other ingredients will be mixed to the cacao during this stage. 6. Temper the chocolate to get a shiny finish and place it in the mould. 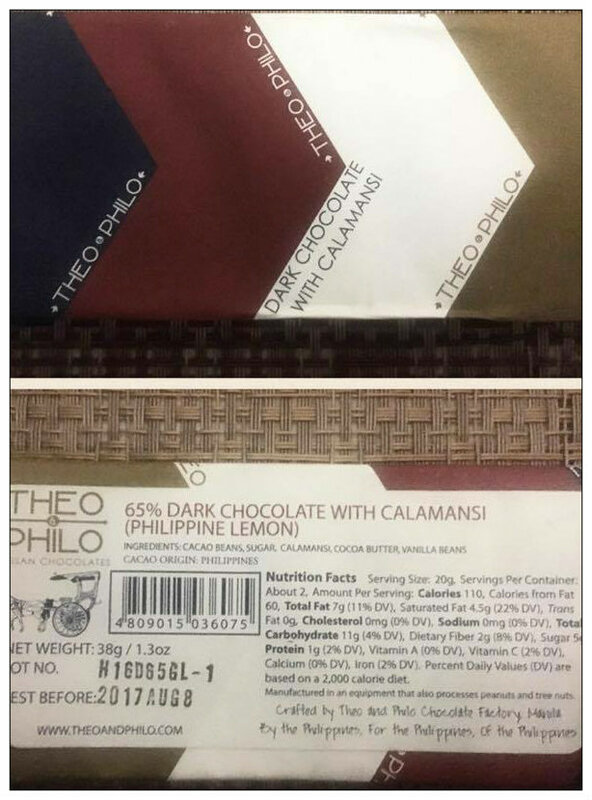 After learning what Theo and Philo is and how they process their chocolates, I got more curios about how each of their chocolates taste because they are not the typical milk and dark chocolates available in the market that has nutty and fruity add-on, Theo and Philo infused Filipino favorites on their chocolates. Theo and Philo have 12 types of Philippine inspired chocolates but Bo's Coffee has only five and I purchase one of each -Dark Chocolate with Calamansi, Milk Chocolate Adobo, Dark Chocolate Siling Labuyo, Milk Chocolate with Barako Coffee and Dark Chocolate with Green Mango and Sea Salt. Their names sounds exciting right? 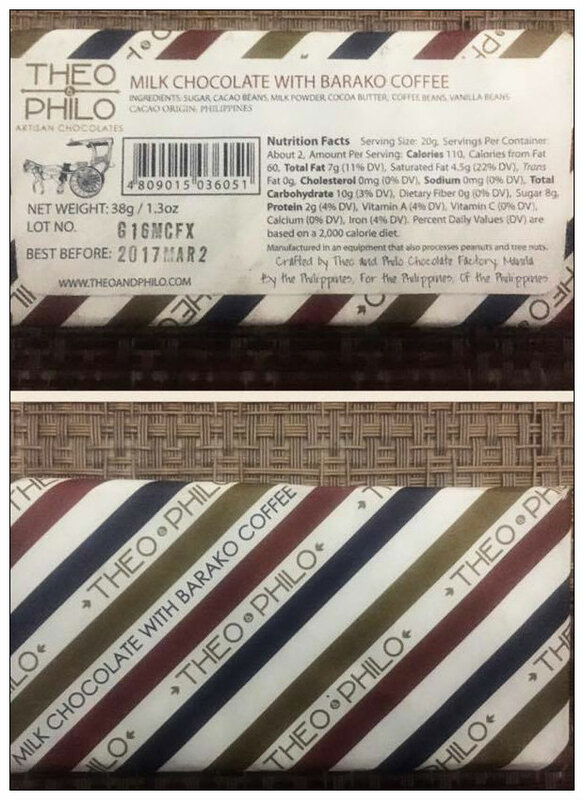 I find Theo and Philo's packaging cute. 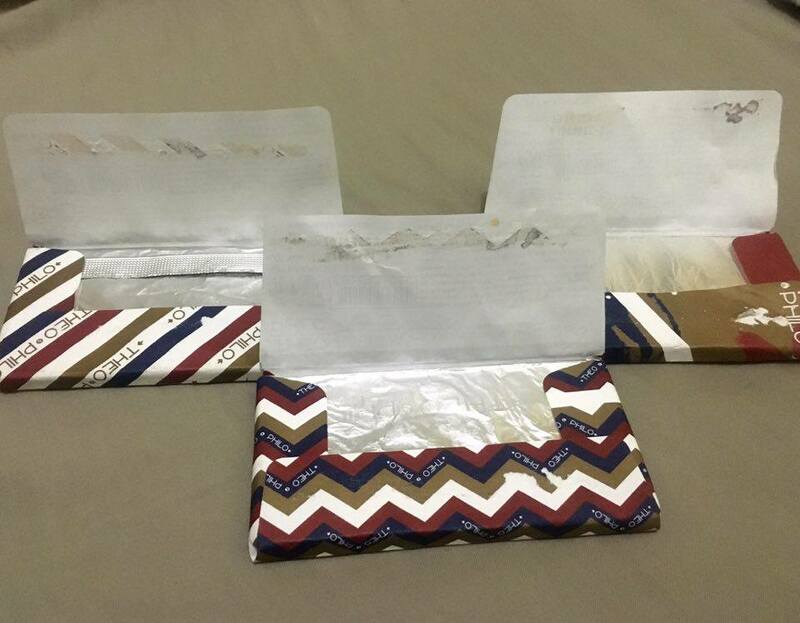 They use paper as their wrapper with different patterns in blue, white, gold and red colors. 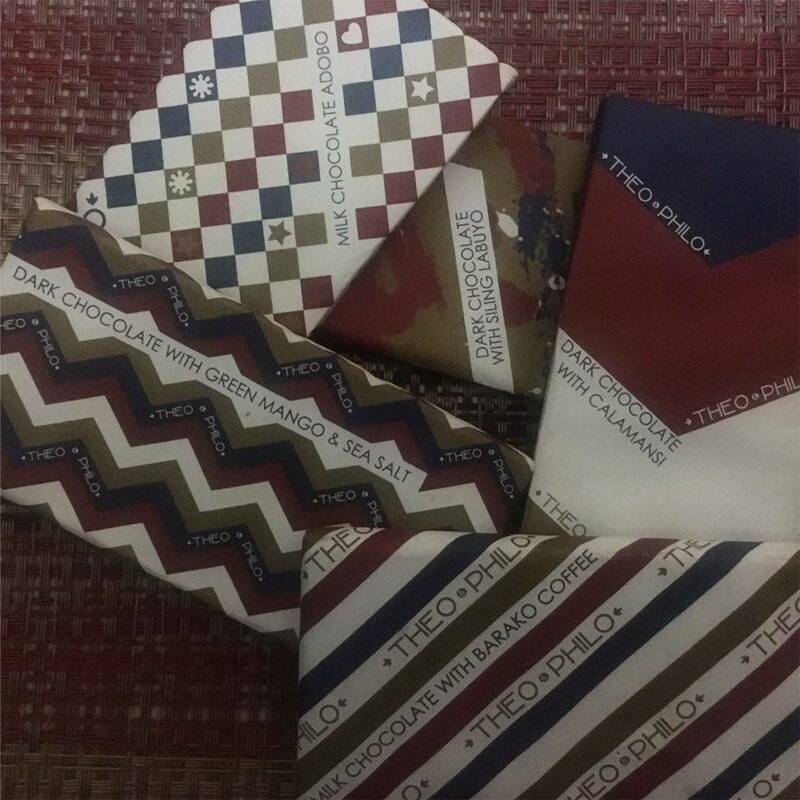 The wrapper are like envelopes and inside it are chocolate bars sealed with a silver foil that has Theo and Philo name and pattern. Now for the verdict, Dark Chocolate with Calamansi has 65% dark chocolate and upon opening the seal, the strong aroma of dark chocolate touched my nose. It tastes like dark chocolate on my first few bites but when I tasted the candied calamansi mixed on the chocolate it gave an after taste of sour and citrus flavor. I never imagined that dark chocolate and calamansi would taste that good. 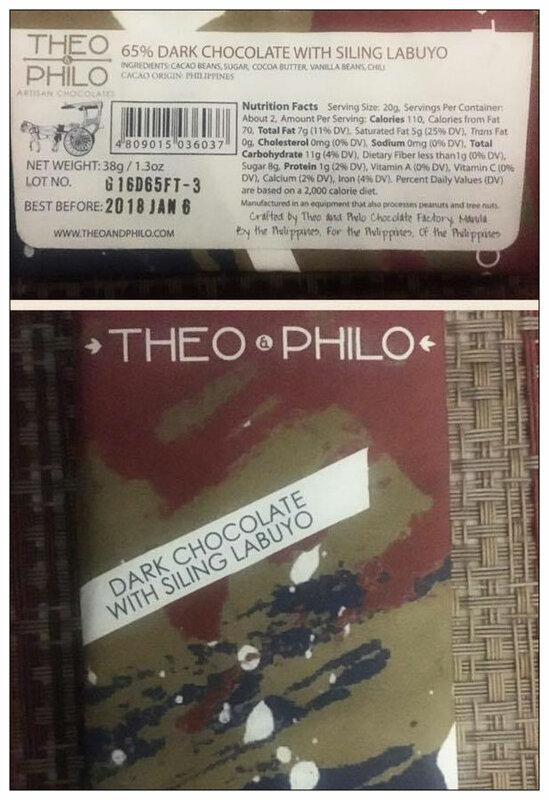 I love adobo that's why Milk Chocolate Adobo excites me more than any other chocolates that Theo and Philo has. Imagine chocolate with soy sauce toffee and black pepper, what would that taste like. As I expected, this one tastes weird. It has that milky chocolate flavor, saltiness from the soy sauce and after tastes of pepper which is spicy . Same with Dark Chocolate with Calamansi, Dark Chocolate Siling Labuyo has 65% dark chocolate as well. This one starts with the strong taste of dark chocolate then spiciness of siling labuyo and it will go back to the taste of dark chocolate. Upon cutting Dark Chocolate with Barako Coffee in half it released a strong scent of barako coffee. This one is not your average chocolate sold in the market. Dark Chocolate with Barako Coffee has a lot of texture coming from the coffee beans and tastes a bit sweet but the bitterness of coffee sometimes overpower the sweetness. If you are a coffee lover, you would definitely like this. 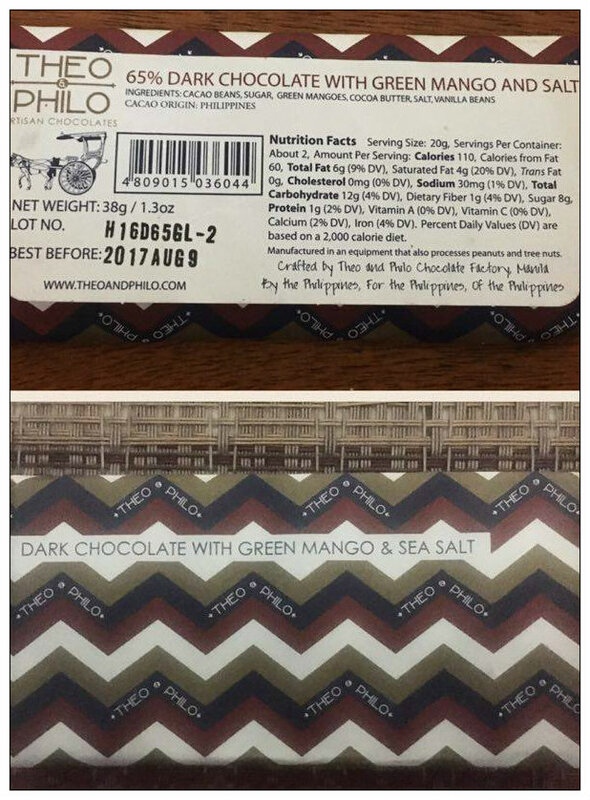 Lastly, Dark Chocolate with Green Mango like the others, this one start with the strong taste of dark chocolate then sour taste of mango and saltiness of sea salt and back to dark chocolate taste again. All of the five chocolates have unique tastes but my favorite is the Calamansi followed by the Barako Coffee. 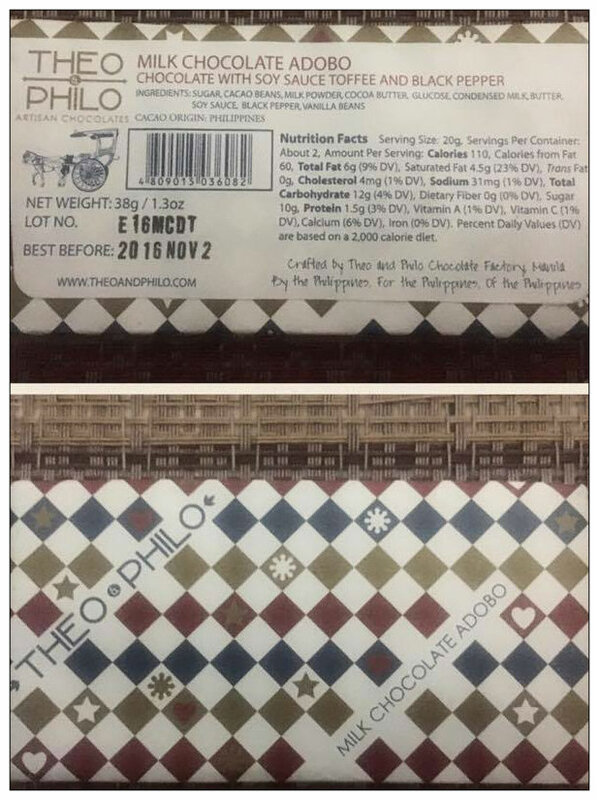 Theo and Philo chocolates are great alternative for the usual chocolates manufactured by foreign companies because first, they gave the usual chocolate we know a twist and second this is crafted to satisfy the taste buds of Filipinos. Such a great post! This chocolate looks delicious! The green mango in the chocolate caught my attention! How was that one? Yummy. I love chocolate! 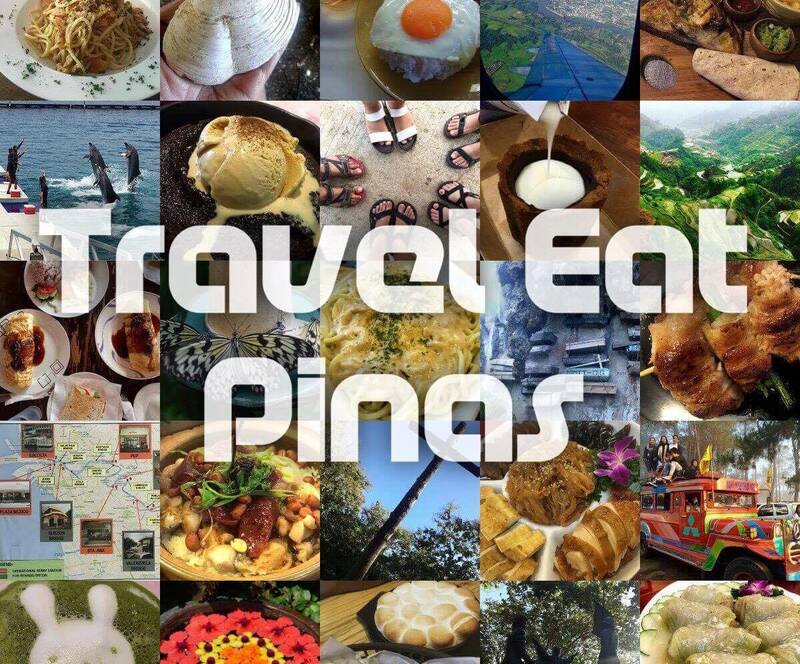 Is this brand also sold outside of the Philippines? I have never heard of it. The different tastes sound very nice. Would love to try it. These are definitely not your typical chocolates, as most in the market stick to the usuals, perhaps with a little twist or variance. After reading, all five chocolates are definitely one of a kind. As a matter of fact, I can't recall chocolates with calamansi, or even siling labuyo! Great that you tried them out and maybe one day, I would too. I've known this brand since after college. Have met its owner too. This is a good social enterprise, and it packs a good story with it. I hope I can try all flavors! Got to try some of these chocobars and i must say that they are a true work of one great Pinoy. Love the concept behind the chocolates. I find the idea witty and unique. So creative as well is the packaging. I am a huge fan of chocolate but I’ve never tried Filipino made chocolates. I’d love to try those with a green mango! Sounds so delicious! This chocolate looks amazing! What an interesting post!